I used to live on the edge of the world. The world was smaller and more metallic for me, back then. I didn't know about trees, or snow, or the sea; I thought laser lights and plastic tubes grew organically. If you'd told me I lived on something called a space station, orbiting a planet called Neopia, I would have looked at you blankly; if you aren't a Grundo, I may well have run away. Non-Grundos rarely strayed from the centre of the station. In fact, as I scuttled about the pipes and back tunnels, making sure screws were tight and machinery well-oiled, I only ever saw a non-Grundo once. This story is about that, and how it led to me discovering that the world was so much larger than the space station. I can't tell you what day of the week it was, because we never had a calendar. I can't tell you how old I was, because we didn't know about birthdays. I can't even tell you what the weather was like or whether it was nighttime or daytime, because such things didn't exist on the space station. It was always dark and chilly, dimly lit by the glow of humming neon tubes. I can tell you that I was with Tinost. He was a blue Grundo, and I was a green Grundo, and we had been friends as long as either of us could remember. We weren't sure if we were brother and sister, but sometimes we wondered, because the other Grundos referred to us as "the twins". In retrospect, it was probably just because we spent so much time together, and because we were so in tune with each other, but I don't think it really matters. Sometimes family is more than just shared genetics. Usually, we worked on the two-Grundo jobs. Work was hard and physical. Tinost was stronger than me, but I was more agile, so we were able to split the work efficiently. He did most of the lifting and hammering, and I did anything requiring quick fingers or sneaking into small spaces. This particular time, though, we were inspecting. This was a job we both enjoyed. Carrying around clipboards and checking buttons and lights and levers worked was physically easier than usual, and it gave us the chance to give our brains a rest. No problem-solving required; all we had to do was check everything matched up with our sheets. Press the red button, green light turns on. Check. Press the blue button, hear a loud beep. Check. It was an important job all the same. We knew that even though we couldn't see what any of these buttons or lights or levers were for, they was necessary to keep the space station running smoothly. We were cogs in a giant machine, and even if we didn't know what the point of the machine was or who was running it, our purpose was to keep the machine going. "Butek, these sliders feels a little stiff," Tinost said, running his hand over a buzzing machine. "Think I should make a note of it?" "Couldn't hurt," I said, pressing a button, and watching LEDs light up in sequence. I checked the box off on my clipboard. Machine #425 was in good working order. "Besides, you've been good with your reports lately. They're not going to write you up if they decide the sliders are okay after all." "True," said Tinost. I think he knew that was the right thing to do, anyway. We just liked to keep the conversation going; it was nice to feel connected. "Okay, I will." I began wondering, as I often did, what would be served in the mess hall next mealtime. I hoped it wouldn't be Beef Rouladen again. Or worse—and I shuddered—Chicken Cordon Bleu. We'd both those meals pretty well constantly for some time now, and I needed a change. Deep-Fried Space Rocks were my favourite, but I knew most of the other Grundos found them too flavourless. It was the crunchiness I liked. Most of the space station food was soft and squashed, like it had been left out under heat too long. And maybe Roast Gargapple for dessert—at least that didn't come in a tube, like most other options. I felt physically sick at the thought of having to squeeze colourless Blueberry Gateaux onto my plate. It looked like chewing gum someone had already chewed, and didn't taste much better. I often daydreamed like this. Sure, I didn't have particularly exotic daydreams—wishing for a particular meal or for sleep time to come quicker was about the extent of it—but even though my imagination was lacking, the desire for escapism certainly wasn't. I suppose it was while I was thinking about Blueberry Gateaux that it happened. That's why I was so surprised when I heard Tinost cry out, and realised I had accidentally pressed something I shouldn't have. I came to this realisation mostly because the wall was collapsing. "Holy piston!" I yelled, backing away so quickly I tripped over my own feet. "Tinost, what happened? What did I do?" "I'm not sure," he said unsteadily, as the noise subsided. A cloud of rusty smoke was dispersing around where the wall used to be. Tinost had been far enough back to be out of range of the falling metal shards, but I could see he was shaken. "I think you pressed the purple button. Instead of the red one." "Why would we even have a button like that?" I said, dazed, and too weak from shock to stand. "It's an emergency exit, I suspect," said a voice from the rusty smoke. "Everything alright back here?" We were astonished to see, stepping out from the cloud, a two-legged greyish blue creature, with tiny eyes and arms, and a fluffy thing protruding from its back. The creature wore a smart black jacket with golden buttons, which made me feel somewhat underdressed in my plain working khakis. The creature's accent sounded strangely soft and lilting to our ears, being used to the harsh voices of the space station. Still, it was understandable. "Yes," I said hesitantly, and somewhat nervously. I couldn't think of anything to say, except: "Who are you?" "I'm Lapnia," said the creature. "It's probably a risk telling you my real name, of course, but in the circumstances I think you're probably harmless, and might at any rate turn out to be quite useful." "I'm Butek," I said nervously, standing up, trying to be polite. "This is Tinost. Are you a mutant? You shouldn't be in this sector." That was of course far from polite, but it was all I could think to say. In daydreams you always imagine you'll be eloquent and accepting of any strange situation that comes across, but real life is trickier. Lapnia smiled, clearly amused. "Actually, I'm an Usul. Some might say I'm quite a handsome one, too." "What's an Usul?" Tinost asked. "I can see we'll get on famously," Lapnia mused. He walked over to the machine I had been inspecting, and pulled out a notebook and pen. He scribbled in the notebook, chuckling to himself, then turned back to us. "An Usul is a kind of Neopet. Much like you two are Grundos." Tinost and I had only ever seen Grundos. 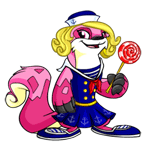 We didn't know that any other kind of Neopet existed. Sure, in a vague way, we knew about animals—meat had to come from somewhere, after all—but the idea that there could be other kinds of sentient beings had us both speechless. "Keep you ignorant, don't they?" Lapnia said, finally. "Quite a contrast to the Grundos out front. You haven't heard about other Neopets from them?" "The service-Grundos live in a different sector," I explained. "It's work-Grundos only back here." "And on that note," Tinost said, "we should go and report this. Someone's bound to have heard the noise. We might get written up." Lapnia frowned. "Actually, I was rather hoping you two wouldn't report this. I've been searching for a way to get into the back tunnels of the space station for quite some time." "Why would you want to do that?" I asked. I couldn't imagine what this creature could have to do with us. "They think Dr. Sloth is about to mount another attack on Neopia," he said. "I've been sent up to search for evidence. But the main space station is useless; it's become a tourist destination since he was defeated all those years ago. I know the information must be somewhere on this ship." I didn't understand the question. For real? What else could we be for? Tinost and I looked at each other. His glance said, This guy makes me nervous. My glance said, Yeah, but this is more interesting than working. It was decided, then. We looked back at Lapnia. "We'll help you." Lapnia tapped on the machine thoughtfully. "Normally I'd be wary of accepting assistance from anyone in a state of such ignorance, but I don't know anything about this part of the station, and you two have obviously been raised here. Yes, alright." Tinost and I didn't know whether to be pleased or offended. Lapnia had had enough sense to see that we wouldn't have the faintest idea where to start looking for anything related to Dr. Sloth, so instead we showed him all the areas we were forbidden to enter. Some he rejected outright ("Obviously leads to the Lever of Doom area, next! "), others we inspected more closely. Tinost kept look-out, and walked ahead of us when we went down corridors. There were a couple of close calls. "Hello there!" we'd hear Tinost say, warmly and loudly, and Lapnia and I would duck into side-passages while Tinost distracted the other Grundos. As we walked, Lapnia explained to me all about Dr. Sloth and Neopia. I was amazed to hear that the space station mostly existed to give Dr. Sloth a place to try and take over a planet, Neopia, and enslave Neopians. The concept of a planet was somewhat beyond me (I imagined it as a larger space station), and I was doubtful of Lapnia's assessment of Dr. Sloth. Even though we were kept busy, Tinost and I had had a relatively evil-free life on the space station. As young Grundos we played in the nursery. We'd been brought out to work only when we were ready for it. There was nothing to indicate that our lives were ruled by an evil overlord. And yet we continued to help Lapnia. Looking back, it makes sense. The only thing more dangerous than making your slaves unhappy is to make them bored. We'd been cooped up in the back channels of that space station for our entire lives. When someone suggested there might be more to life than just lasers and buttons and clipboards, we jumped at the chance to experience it. "I think this is it," Lapnia said finally, after we had been sneaking around for what seemed like hours. We were in a neutral, plain corridor with no doors. I glanced at him. "Are you sure?" I said, doubtfully. Lapnia grinned. "I'm sure." He indicated up above my head, to a grate. "We need to get up there." "You mean—the air ducts?" Tinost said. "Yes," said Lapnia. "We've almost circled the entire space station, haven't we?" "And we're nearly back at where we came. Well, it looks like you Grundos are permitted access to most of the space station, except of course the centre where the public can go, and except for certain forbidden areas. Those forbidden areas lie in a sort of pattern—there have been seven so far, and there should be an eighth here, except there isn't. I could identify the other seven, and I very much suspect that Sloth's private quarters must be somewhere around here." "Gosh," I said. I couldn't really think of anything else to say. "So what do you want to do now?" Tinost said. Lapnia eyed the grating. "Give me a leg up. I may need some of your tools." We crawled through the musty air vents, and stopped briefly at every grating we went past. Lapnia seemed to have a good idea of where we were headed; even though Tinost and I knew the space station, we didn't seem to have the complete map in our heads like he did. Still, having Lapnia in front of us made our progress slow. In retrospect, Usuls are obviously designed for forest living, not space stations; Lapnia's tail might have been useful protection or decoration in the woods, but in a tight air vent, it was a hindrance, and we nearly tripped over it several times. Eventually, Lapnia stopped and didn't start moving again. He shuffled along so that Tinost and I could also see out of the grating. "Sire, the surveillance mission is proceeding according to schedule," said a voice. I peeked out through the grating and saw a smartly dressed orange Grundo, standing in front of an abnormally tall green figure. 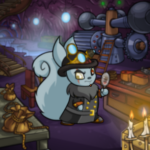 The figure didn't seem to be a Grundo, but then he didn't look like Lapnia either; I supposed he must be another kind of Neopet, like Lapnia had talked about. "Excellent," said the green figure in gravelly voice. "We should be in a position to begin Operation Merger in mere months." He turned to look at a large diagram, covered in tacks, with colourful string forming criss-cross connections. "That's Dr. Sloth," hissed Lapnia under his breath. "We have already begun designing the necessary marketing documents, sire," said the orange Grundo. "Would you like to review them?" Dr. Sloth nodded, and the orange Grundo turned on a projector, facing a blank wall of the room. A picture flicked onto the wall. It was a blue and green circle, surrounded by silver objects and with a header proclaiming: "SIDE BY SIDE FOR A NEW NEOPIA". It didn't make much sense to me, but I heard Lapnia gasp quietly. "Very nice," said Dr. Sloth. "This would be for later in the campaign, I assume. Our first step should be to educate the public." "Of course, of course," said the Grundo hurriedly. He pressed a button, and the picture changed. Now we saw pictures of strange creatures. They were evidently other Neopets. "These are the staff of the Neopian Times. We have invited them to the space station under the pretence of letting them theme an issue around space station dining; all funded and paid for by us, of course." Dr. Sloth began to laugh. "It's an offer those greedy hacks can't refuse. And once they are appropriately re-educated, they will re-educate the public." "We thought we would start with a series of articles on the high quality of life in the space station," the Grundo explained, "followed by an editorial on Neopia's poor economic performance due to an inability to capitalise on resources outside the atmosphere. Then an anonymous letter to the editor could suggest that merging the space station with Neopia would allow Neopia to take advantage of the space station's efficient and effective governance system." "Yes, yes," said Dr. Sloth exuberantly. "We don't need to enslave the Neopets. They'll happily and willingly enslave themselves." He began to laugh, but not in a way I'd ever heard anyone laugh before; he wasn't amused. His laughter was filled with cunning and greed, like he'd just stolen candy from a baby Grundo. There's no way other to describe it than to say his laugh was pure evil. Lapnia nudged me and Tinost to indicate he had heard enough, and we crawled away. Once back in the relative safety of the corridor, Lapnia collapsed against the wall. "Is it really that bad?" I said, kneeling down to him. "It sounds like he just wants to educate everybody so they'll want to enslave themselves, whatever that means." "Re-education," Lapnia said despondently. "That means brainwashing. Brainwashing means he'll force you to believe something you don't want to believe. And slavery is being forced to do something you don't want to do. Dr. Sloth wants to take Neopia over, as usual, only the way he's planned it, everyone's going to think he's doing them a favour." When he put it like that, I could see why Dr. Sloth had laughed so evilly. "What are you going to do?" "I don't know," Lapnia said. "I guess I have to try to convince the staff of the Neopian Times not to come to the Space Station, but why would they believe me? Who's going to believe me?" Tinost and I glanced at each other. His glance said, Do you think...? Mine said, It's worth a try. We looked back at Lapnia. "They might believe us." Lapnia stared at us. "Grundos who've worked in the space station since they were born? Grundos who are themselves slaves of Dr. Sloth?" He began to grin. "Well, you might be disgruntled ex-employees, true enough, but if I know journalists, there's nothing they like more than a tell-all exposé straight from the Grundo's mouth. We can make this work." We did make it work. Lapnia smuggled us off the space station easily enough; we were able to sneak out the emergency exit before they built it up again, and once out on the floor, we looked no different to the service-Grundos. Getting passage onto the spaceship back to Neopia was more difficult, so Lapnia bought suitcases big enough to fit us, and pretended he'd stocked up on souvenirs. I won't pretend the journey was comfortable, but we made it. Lapnia had called the Neopian Times before we set off, and they met us in the forest right outside Neopia Central. I'll always remember climbing out of the suitcases and feeling the sun's warmth on my skin as I saw the beauty of the natural world for the very first time. We barely registered the flicking of the cameras as we exclaimed at the feeling of soil under our feet and stroked the tree bark. Lapnia and the journalists were patient, and gave us a few weeks to adjust before we had to front up and tell our stories. It was the front of the Neopian Times for weeks: "SLAVES FROM THE SPACE STATION TELL ALL", "THE REALITY OF LIVING UNDER DR. SLOTH'S TYRANNY", that sort of thing. Dr. Sloth's evil plans didn't stand a chance after that. Although it's only been a few months, people are aware they have to be cautious when visiting the space station, and certainly no one is accepting offers from Grundos that seem too good to be true. I've told this story many times now, and I'll never tire of it. It always amazes me how I thought I was happy living on the edge of the world, fixing and building and testing machines I didn't understand. I didn't know what else there was to life. Tinost and I are planning to go back and rescue all the other Grundos who don't know what they're missing. I hope we can count on your help and support when the time comes.